Leek dumplings are a traditional Passover food for many people of Turkish and Balkan descent, my family included, though I couldn’t tell you what makes this specifically Passover food. To be honest, it’s not really a dish that my family makes anymore — at this point, the koftes de prasa have largely been relegated to tales of my mother’s childhood, yet another delicacy that her grandmother and aunties (great aunties?) would make. Plus, our family’s recipe isn’t one I’m likely to make — it calls for leek mixed with ground beef, fried into patties and then simmered in chicken broth. That said, though, koftes de prasa — literally, leek patties — are pretty much good all the time. 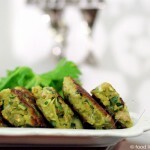 And even though many versions are very much meat-based, like my family’s, these patties can easily be made vegetarian. Plus, they’re super-simple — this recipe contains all of five ingredients. 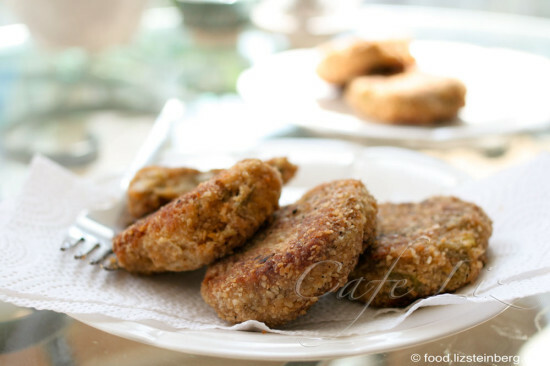 Leek patties are made by Sephardic Jews from parts of the northern Mediterranean and through the Levant, and as is typical of a traditional dish, each family has its own variation. Likewise, the seasoning varies depending where the family is from. Levantine versions contain a longer list of spices (some examples cited here) — think of the spices commonly found in baharat, many of which are known in the west as pie spices. My spicing is simple, though. As is typical of Turkish Jewish cooking — well, at least in my family — I’ve seasoned mine primarily with salt and pepper, so the main flavor is, well, leek. 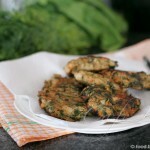 These leek patties were a nice addition to our Passover seder. It’s a miracle there were any left over to photograph, as they were quite good. Given the price of leek around here — I think I paid 25 shekels a kilo for a fat, handsome specimen — they really are a delicacy. Rinse the leek well to remove any grit, and chop into thin slices. Place in a pot with the olive oil, and let simmer on a medium-low flame, stirring occasionally, until the leek is thoroughly soft (this can be done a day before you make the patties). Mix the sauteed leek with the matzo meal, the eggs, the water, the salt and the pepper. In the meanwhile, heat a pan to fry the patties. I like using cast iron. Pour some oil into the pan — it should coat the bottom of the pan. Once the pan is hot, lower the flame to a medium or medium-low setting. To bread the patties, pour more matzo meal into a bowl (you can also find matzo meal-based products meant specially for breading — basically, matzo meal with some seasoning). 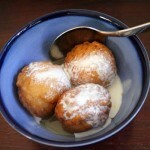 Wet your hands to keep the batter from sticking to them, and take a lump of leek mixture slightly larger than a walnut. Form it into a ball, and then flatten it slightly into a fat disc. Drop it into the matzo meal and coat on both sides. Put the patty into the hot pan. In the meanwhile, make more patties and add them, too — I can fit about 7-8 into my pan at once. Once each patty has fried until golden on the bottom, flip and fry the other side until golden as well. Add extra oil as needed so that the patties are always sizzling in a small amount of oil and not sitting in a dry pan. Remove cooked patties to a paper-towel lined plate to absorb extra oil. Serve warm. If you intend to refrigerate these in order to eat later, you’re best off reheating them in a frying pan with a small amount of oil, or at least in the toaster. Microwaving them will make them soggy. 6 Responses to "Prasa (leek) patties for Passover"
I did those last week but mine were too soft inside.I think I did not put enough matzo meal..otherwise I had exactly the same ingredients as you. I got so excited when I saw what you were making – then disappointed, as I’d rather not eat eggs – I know when it’s not Pesach, I could do it with tofu – or if ever I switch over to eating kitniyot 🙂 – so this will wait til after Pesach. I look forward to it. amazing …. so yummy! thanks for another great recipe. made the vegetable broth and matzah balls too …. excellent! i’ll be making both the patties and soup many more times! hag sameach! We were lucky and got some leeks in the Petach Tikva shuk for NIS 7 yesterday. i’ve waited all year to make these again! ….. delicious again! i am so looking forward to making these again! so delicious!